As I'm sure most of you have heard by now, the Mariners signed Corey Hart to a 1 year, $6 million dollar deal with incentives that could push his contract to $13 million. 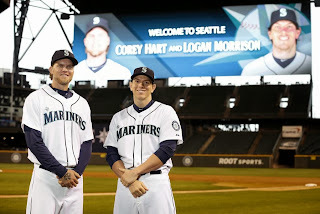 They also traded Carter Capps to the Miami Marlins for Logan Morrison. The loss of Capps is not exactly a major thing. Bullpen arms are a dime a dozen and decent young arms might push it to a quarter. He was labeled as an up and coming closer, but as we've seen all over baseball, a serviceable closer is not something that should be coveted given how mercurial bullpen arms, let alone closers, can be. All that is to say, two more OF/1B/DH types have been added to the roster for cheap. $6 million base salary for Hart and a young reliever who is still developing for another. What does this mean for the Mariners? It means they're not done. Hopefully. Both Hart and Morrison are high risk/high reward type of acquisitions. The risk, obviously, is injury. Hart has the knees of a 80 year old with osteoporosis. Morrison is Franklin Gutierrez Lite as far as time on the disabled list. The knock on Hart isn't so much a Gutierrez type of problem as much as it is a knee surgeries problem. Yes, surgeries, plural. His recovery and how his body handles playing is the risk with him this season, but on a one year deal its tough to get burned on it. He's wanting to prove his health and, if he comes back healthy, can provide around 20-25 home runs, a .270ish average and an .820ish OPS. That's probably the high end of what to expect, but that's part of the "high reward" half of this particular deal. Even if he isn't completely healthy, he can provide more offense than pretty much any other outfielder the Mariners had on the roster last season. That doesn't exactly get the warm fuzzies bubbling up from the toes, does it? Still, Morrison is entering his age 26 season in 2014 and not scheduled to become a free agent until 2017. Is he hurt a lot? Yes. Is he a player worth grabbing for a young reliever? Absolutely. While I'll grant that the high risk is him becoming another Franklin Gutierrez, the high reward is him becoming, well, Corey Hart. The numbers for both players in past seasons won't tell you much except what they've done in the past. With Hart coming off multiple surgeries and Morrison never playing a full season, any kind of prediction would be equal to predicting the next number in a random number generator. We all know what the risk/reward is for both players, but its worth a shot. Hart is on a one year deal and if he proves he's healthy, the Mariners will be the beneficiary. If LoMo proves he's capable of staying healthy, the Mariners have a couple more years of control for cheap. Where will they play? At this point, there's no reason to even ask that question. While roster construction is a legitimate question a week before spring training, its not legitimate in the middle of December. The offseason still has a couple of months to go and it wouldn't make sense for the Mariners to just stand pat for the rest of the offseason. Its possible that that's exactly what will happen and the roster will be a complete mess, but its also possible I can get struck by lightning while on my way to cash in on a winning lottery ticket. That doesn't mean its likely. Both acquisitions have high risk, but like most of those types of acquisitions, they're also high reward. If both players fizzle in 2014, the worst that can happen is the Mariners will be just as bad as they were before. If, however, they come out of the chute with a bang and it continues throughout the season, it will be a sight to see. The only way we'll find out is to watch and it wouldn't be a bad idea to have our fingers crossed while we do.